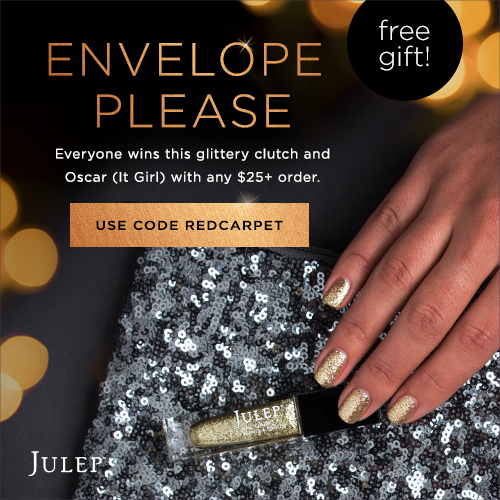 Julep is offering you a chance to snag a glittery clutch and a nail plish for FREE with any $25 order! I love it when they do things like this. It makes it everything a better deal! You will receive a Gunmetal Silver clutch and a sparkly gold polish. Offer expires 2/23/15 at 8 am PT, or while supplies last. Gunmetal Sequin Clutch: An 8’’ x 12’’ zip-top bag with two mini pockets and a whole lot of sparkle. Oscar (It Girl): Ultra chic, multidimensional gold glitter. Allure Sample Society March 2015 Spoiler! FabFitFun Spring 2015 Spoiler and Coupon Code! Fortune Cookie Soap Box Spring 2015 "Wonderland"
Glossybox February 2015 Review and Coupon Code! Fabfitfun Spring 2015 Coupon Code for $10 Off! Popsugar Must Have March 2015 Sneak Peek! OuiPlease 20% Annual Subscription Coupon Code! Instagram GIVEAWAY by Bits and Boxes! Boxycharm February 2015 Spoiler #2!